Hawk's Eye is well-known to shield anyone against negativity. In fact, Hawk's Eye, also called Blue Tiger Eye, shields not only the body, but also protects the soul against negative vibration. It's a very powerful stone and is associated with the brow chakra. Tiger’s Eye Bracelet protects anyone from the intention of others. This Tiger Eye stone boosts willpower and stabilize the emotional when working through lifestyle changes. It's also associated with the sacral chakra, solar plexus and root chakra. The Red Tiger Eye takes the energy from the two other stones and amplify their protection. In other words, the tiger eye stone and the hawk eye stone are energies. This is why the combination of the three stones make them 10-100 times more protective then other bracelets out there. The quality of our product 100% verified. Absolutely beautiful, good quality and well pack, and nice box. great presentation. 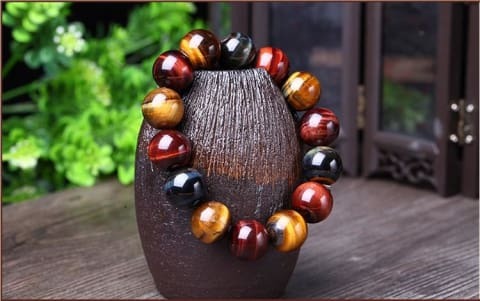 Great Tiger Eye stones, fabulous colours and well made. comes complete with a repair kit. nice padded box and well packaged. Very comfortable and beautiful. Nice to wear Great store.